Greg asked about employing a lager yeast or an ale yeast when home brewing a “California Common” and would the results be the same. 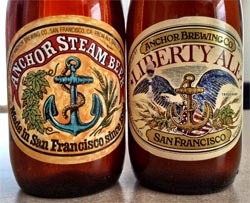 He also asked about the specific differences between the malt bills of Anchor Steam and Liberty Ale. Bob: Homebrewing is on such a small scale and has so many variables that the use of one type of yeast can easily mimic the other in many cases. Most homebrewers prefer to use an ale yeast because it’s often easier and more forgiving than a lager yeast. My homebrew friends tell me that they can make almost any style of beer using ale yeasts. They also say that they can use an identical malt bill and get noticeably differing results using different yeasts. The short answer is “yes.” You can get the same results, or really, really close using either an ale or a lager yeast for the same brew. It does depend somewhat on how you tend your fermentation, however. As for the Anchor Steam/Liberty Ale malt question, I’m going to leave you guessing. « Ask Bob Brewer: Bottle Conditioning & Yeast Cultures What’s in a Name?